What are Binding Spines Called? The term "binding spine" can refer to many different kinds of...well, binding spines. Basically a binding spine is the strip or piece that actually holds your pages together, creating a bound book. This is different from, say, a binding cover, which refers to a wrap-around binding piece, or something that covers your pages completely. Instead, these are just a spine that attaches to a stack of paper to bind them. Most binding spines can be paired with report covers, if preferred. 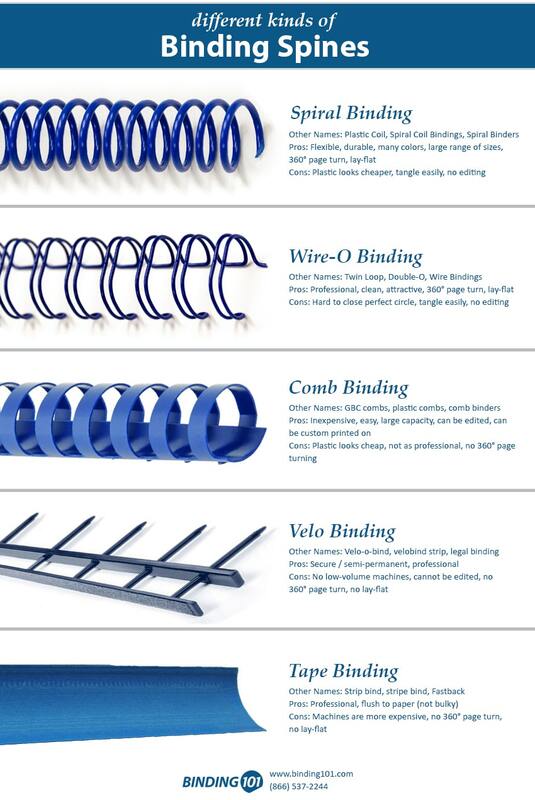 There are several different styles and materials of binding spines, including plastic spiral binding coil, wire-o, plastic comb, velo binding, and tape binding. So when someone asks what a binding spine is called, it could really refer to any of these specific styles. Use the guide below to help you remember each different kind of binding spine; save or pin this image for future reference.